Think big. Small spaces get cluttered quickly, so resist the temptation to landscape on a petite scale. Instead, make a statement with a chunky, oversized pergola; boulders large enough to sit on; or a dramatic container that takes command of the space. Mirrors (or polished steel plates) can be used to reflect light and enlarge views; and large gates or doors, either freestanding or mounted on fences or walls, create the illusion of additional space beyond. Limit your planting palette to just a handful of species; it's far more effective to use a dozen each of three different plants, than three each of a dozen species. And if there's not enough space for all the full-size dining chairs you'd like, consider framing the dining area with a wood bench that will both define the room and provide additional seating when it's needed. Next, I'll write about my fourth tip for landscaping small spaces: Get wet. Be colorful. Knowing that bright colors seem to advance toward us, and dark colors seem to recede, create depth and dimension in small spaces by choosing appropriate hues. Use dark paving on patio floors. 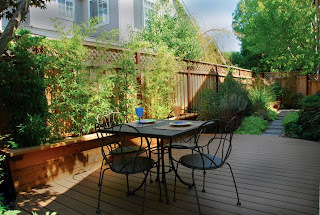 Stain perimeter fences dark brown or olive green, or cover them with dark green vines such as Hardenbergia 'Happy Wanderer'. Fill the foreground with variegated or chartreuse foliage, including Heuchera 'Key Lime Pie' and Hakonechloa macra 'Aureola' or 'All Gold'. Then bridge the front and rear spaces with textures, not colors — grasses or succulents look great en masse, with a specimen pot, fountain or statue as a focal point. Next, I'll write about my third tip for landscaping small spaces: Think big. vertical elements including tall, narrow plants (such as bamboo, crepe myrtle or 'Whitespire' birch trees); raised planting beds or berms; or freestanding trellis structures. Be sure to include accent lighting to show off these features at night. In the other direction, excavating a sunken garden can pose construction challenges, but the results can be spectacular. Retain and frame the area with a stone seatwall; include niches in the wall for candles or planter urns (including self-watering styles) and seat cushions with delicious custom fabrics. 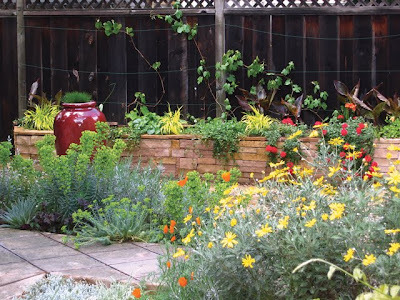 Next, I'll write about my second tip for landscaping small spaces: Be colorful.